Warm Up, Feel Fit, Look Great!! Women's Triumph Compression Fitness Tights support your muscles and cover your legs when the chilling air hits. Women's Spandex Fitness Tights provide great compression and stretchability so you can move freely through all your workouts. Ride, Ski, Run, Cross-Fit Training . . . these fantastic tights do it all and feel great!! 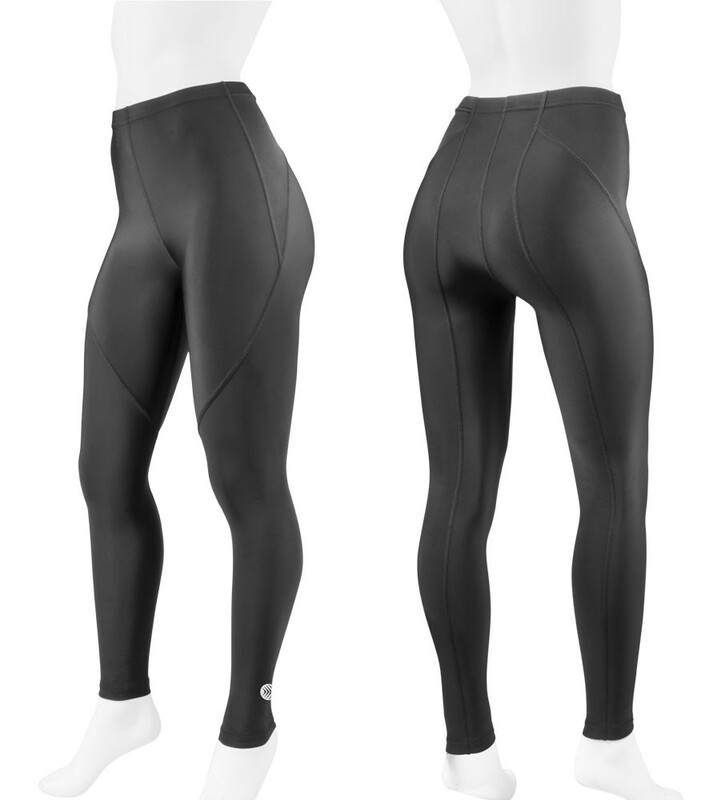 The Women's Triumph Compression Fitness Tights have a flattering fit alone or pull them on over your favorite Aero Tech Designs Cycling Shorts to enjoy your bike ride and prevent chafe between the legs. The Compression Fitness Tights have a highly engineered design to complement the working muscles during rigorous workouts. The Women's Triumph Compression Fitness Tights design lines are classy black on black color for style and the details are stretchable stitch. * Soft Nylon and Spandex Fabric with six way stretch for amazing fit..
* Spectacular Compression Comfortably Hugs Muscles oxygenating for better performance! * Waist is a soft, 1" elastic that stays put. * These stylish and functional tights have black on black flattering style lines. I have circulation issues so whether riding my bike or working out the extra compression aides my circulation. Really like the calf compression. I also will sometimes just throw a dress on over the tights and I'm ready for work. Would love them in other solid colors (women's sizes). Perhaps navy blue, grey or hot pink. Made of quality material, only issue is sizing off for me according to the size chart. Slightly too large, so I am not getting the compression aspect that I initially purchased the tights for. If your not certain suggest that you order 2 sizes and return the one that does not fit. this is my 2nd pair, use them to wear to the gym!! I ended up returning these, sadly. I didn't like the seams running down the back of the legs as I found that they kind of "bunched up" behind my knees. I wanted to like them! Also, they were long enough that I could pull them down to my toes, and I'm 5' 7" with heavy legs, so they must be made for a really tall woman. But I still ordered other items and will continue to do so as I love the quality and prices. Like many people, you amass a collection of compression pants during the hunt to find the ones that meet your needs. I have been searching for compression leggings to help me to drop some weight and tone up after getting pudgy while recovering from multiple surgeries that greatly limited my activity level for several months. It did not help that my aunt often visited bringing wonderful Southern comfort meals and homemade lemon pound cakes that I just really did not even try to resist. Needless to say I am so glad to be healthy and mobile and back to cycling, hitting the gym and spending more time outdoors. My challenges have always been finding high quality garments for non-twig sized women as some brands don't make their products to fit some of us curvy grown women ( if they do make XLs, etc they sell out so quickly); finding leggings that completely cover my ankles as I have a short torso with a 34" inseam; having a comfortable rise to support my mid that will stay put while active and made of material that won't pil or attract lint. I have found this to happen with even expensive leggings ( I am extremely fanatic about fabric quality and will lose it when black fabric is of poor quality. I'm a busy with a demanding job, studying for a professional certification, always on the go with my son's soccer activities along with the typical mom duties most of us juggle). I refuse to spend time shaving lint off fabric..I have better things to do with my time. I know, I know...I clearly have deep issues with lint. These leggings exceeded my expectations. They are lightweight, supportive , have a great finish that does not pil or attract lint and cover my ankles. I've noticed less muscle soreness as I step up my activity, especially after biking. I don't ever have to adjust them no matter if I am riding full speed, bending over, squatting, stretching etc. They don't chafe so far and they dry quickly. They were shipped promptly and arrived sooner than anticipated. I will definitely order another pair. The XL are stretchy, supportive, comfy and fit my dimensions well. Highly recommended. I am also contemplating ordering a large for max compression fit. Excuse any type-o's...I'm too tired to spellcheck. I have spent hundreds of dollars buying compression wear only to be disappointed every time! This is the first time I have been overjoyed by my purchase! These are the best I have ever found! BEAUTIFULLY MADE AND THE FIT IS SUPERB! God bless you Aero Tech! Love these compression tights. Great for circulation; comfortable fit and overall stylish. My only wish is that they become available in more colors. Compression fitness tights?? I don't think so! They don't compress my legs. Love the compression in the tights. They really hold up. I use them for step aerobics and lifting days. Overall they are a great fit. I am 5'8 and I was fine with the length and tight fit. I purchased the 2x. This was my second order. I got them because my physician ordered lower body support and compression These tights fit well and feel so comfortable and are "just what the doctor ordered". As I stated before, I am not easy to fit but theses are perfect. They also wash well and the seams hold tight despite the stretch. My only suggestion would be to provide a shorter length option.